EL wire, or electroluminescent wire, is a flexible wire coated in phosphor. Apply the appropriate voltage and it lights up! 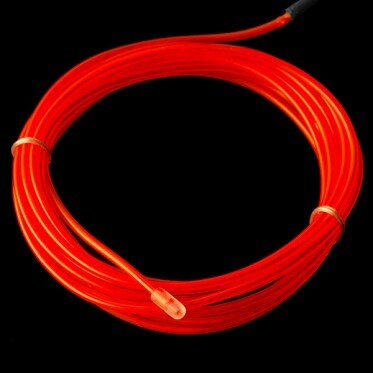 Each EL wire looks a lot like a thin flexible neon tube and they come in many bright colors which can be driven pretty easily with an inverter. As this is a chasing EL wire you will see the glowing red light seem to move across the length of itself as if it were flowing out the end, this feature provides you to add some really fantastic lighting effects to your next project!